Honorio “The Rock” Banario of Baguio City, Philippines failed to accomplish his mission to deliver the undefeated Hawaii MMA Elite representative Lowen Tynanes the first loss in his professional career. The entire world looked on as both athletes kicked off the first round of the much-awaited ONE Lightweight World Grand Prix on the main card of ONE: HERO’S ASCENT which went down last 25 January at the Mall of Asia Arena in Manila. Tynanes pulverized Banario in the first round to win by way of technical knockout victory over the former ONE Featherweight World Champion. Despite the loss, Banario gave his personal assessment of where he feels Tynanes is at in this point of his career. “I think he’s not as powerful as advertised. He’s not heavy on the ground when he comes to pin, but he positions himself really well,” Banario said in an interview with inquirer.com. Like many of his Team Lakay Brothers who are wushu champions, Banario’s strengths lies in his stand-up game. As such, he looked to test Tynanes’ striking. “The Rock” was able to land a few solid shots but it had very little effect on the well-trained Hawaiian athlete who simply powered through front-line defenses. After a few brief striking exchanges, Tynanes turned to his bread and butter and drove Banario towards the canvas with a single-leg takedown. Tynanes showcased his world-class wrestling skills as he transitioned immediately into side control and then into a mounted crucifix. It’s a move Tynanes has used multiple times with his previous opponents to dominate them with his heavy top game. With no way to defend himself, Banario was forced to receive a barrage of fists and elbows from the Hawaiian. Tynanes continued relentlessly until the referee intervened and stopped the contest. Despite being dominated on the ground, Banario felt that the result could have been different if only his arms were free. Tynanes now advances to the semi-finals of the ONE Lightweight World Grand Prix where he patiently waits to take on the winner between Timofey Nastyukhin and Eddie “The Underground” Alvarez in their scheduled bout at ONE: A NEW ERA on 31 March in Tokyo, Japan. 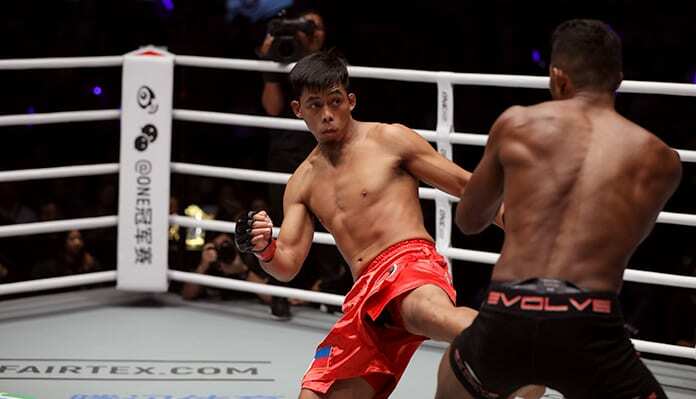 Tynanes met the current ONE Lightweight World Champion and Banario’s teammate, Eduard “Landslide” Folayang, in just the second bout of his professional career. 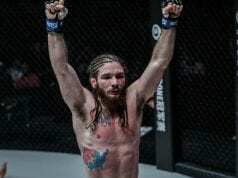 He was able to win via shocking technical knockout over the Team Lakay veteran. If Tynanes wins the Grand Prix tournament and in the event that Folayang is still champion, they may square off once more for down the line. Given his experience with Tynanes, Banario believes that Folayang would have the advantage this time around and that the Landslide’s striking would prove too much for the Hawaiian. “He (Tynanes) barely landed a punch on the feet. Should he fight Eduard Folayang again we must focus on wrestling defense,” Banario concluded.